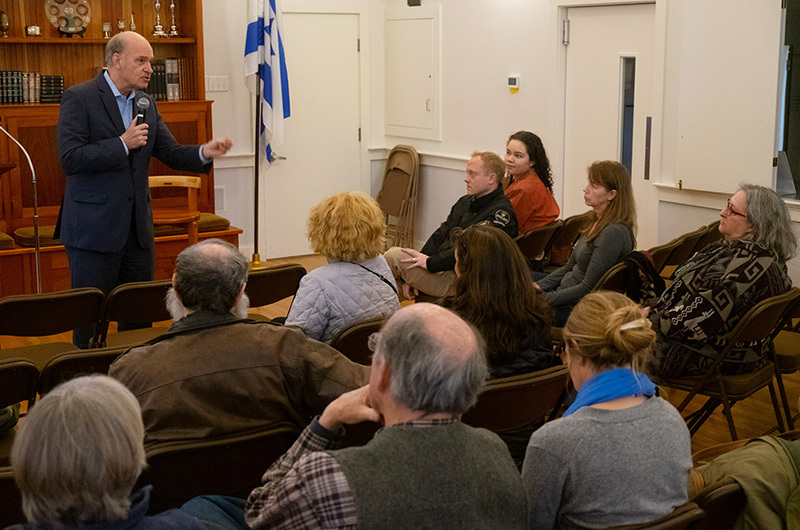 Congressman Keating addresses constituents at the Hebrew Center. 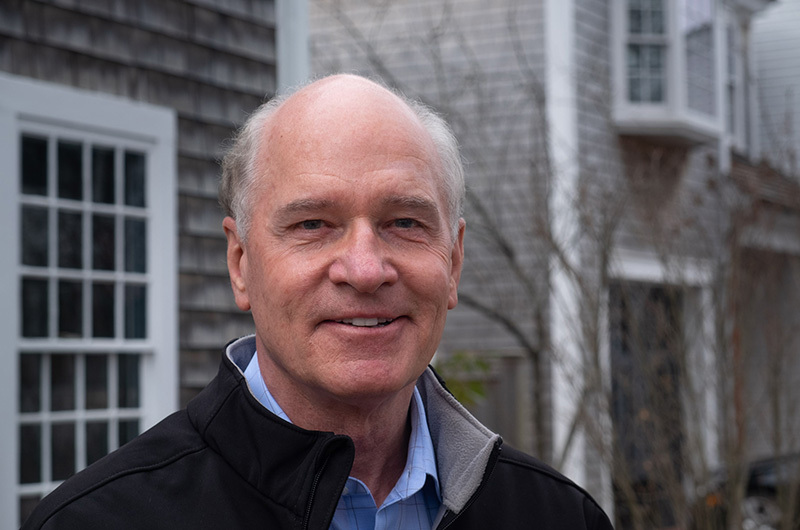 Congressman Bill Keating, meeting with Island constituents Thursday evening in Vineyard Haven, fielded questions ranging from economic development to Washington gridlock to legislation he sponsored that would clear the way for the Mashpee Wampanoag Tribe to build a casino in Taunton. 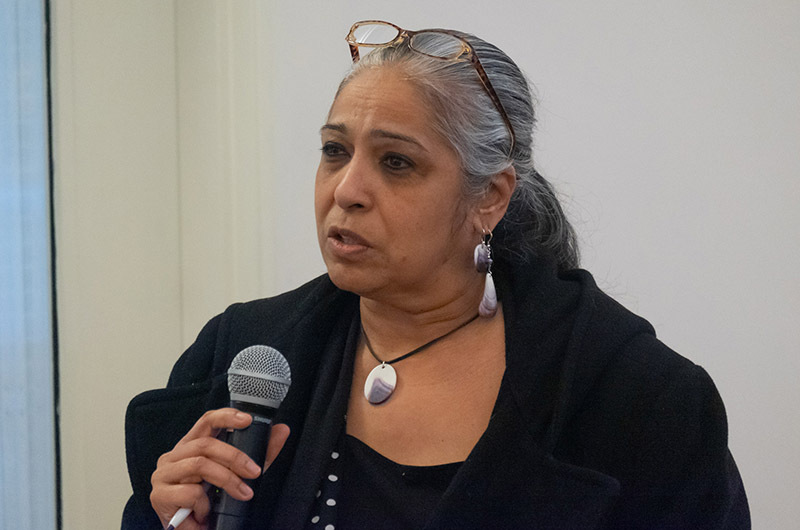 That bill is opposed by the Wampanoag Tribe of Gay Head (Aquinnah), and tribal chairman Cheryl Andrews-Maltais was among about 25 people who attended the congressman’s town hall at the Hebrew Center to listen and air concerns. Ms. Andrews-Maltais asked the congressman whether he would amend the bill, which would affirm the status of the Mashpee Wampanoag’s mainland reservation. A 2018 ruling by the Department of Interior said the federal government had lacked the authority when it took land in trust for the Mashpee’s reservation, effectively ending that tribe’s bid to build a casino. The Aquinnah tribe has been shut out of consideration for a mainland casino for lack of trust lands there. “I was wondering if you’d be willing to amend your bill . . . so we too will be protected by the Department of the Interior’s negative decision about Wampanoag people being able to have land in trust outside of our own homelands,” said Ms. Andrews-Maltais, who went on to say this had been promised to the Aquinnah tribe when the bill was first reviewed. Mr. Keating offered his congratulations to the tribe on its construction of a bingo hall in Aquinnah, but said he was not aware of any promise to include them in the Mashpee bill, adding that any protections for the Island tribe would have to come from additional legislation. In an interview with the Gazette earlier in the day, Mr. Keating was careful to say his interest was in supporting the Mashpee tribe's federal recognition and was not related to the casino issue. He said the bill has broad bipartisan support and is supported by other tribes nationally. Many of Mr. Keating’s remarks concerned economic issues. Mr. Keating used the term “blue economy” to describe a vision for development in the south coast, Cape and Islands, with a focus on promoting the district’s status as a marine sciences hub and the location of the Vineyard Wind project, the first large-scale offshore wind project in the country. Mr. Keating also emphasized the need to raise the cap on H2B and J-1 visas for foreign workers in order to sustain a summer economy. Vineyard business owners struggled to fill positions last summer because of restrictions that made it more difficult for returning workers to apply for a visa. Currently, the cap is set at 66,000 visas for the entire country. He said Homeland Security secretary Kirstjen Nielsen has the authority to double the cap on visas, and he and 100 other lawmakers have urged her in a letter to do so promptly. At the town hall, a couple of residents brought up climate change as an area of urgent concern and asked about Mr. Keating’s sponsorship of the Green New Deal, a federal resolution introduced in February outlining bold initiatives for combating climate change. “Especially as an Island, this whole community is very concerned,” said Nicola Blake of West Tisbury. Ben Robinson of Vineyard Haven, who recently traveled with his children to Washington D.C. to advocate for the deal, pressed Mr. Keating on the need for immediate action. “You used the word aspirational, I would use the word essential,” he said. Mr. Keating also spoke briefly about chemical contamination caused by PFAS across the district, including in some private wells south of Martha’s Vineyard Airport. Airport officials have stressed that investigation expenses related to PFAS have put a strain on their budget. “We’ve asked for an appropriations request to double the money to deal with that. It’s becoming a real concern nationally,” said Mr. Keating. Mr. Keating spoke frankly about the Trump administration, calling the federal government shutdown earlier this year a “hostage taking” and bemoaned the country’s loss of reputation amongst foreign allies. He said he agreed with House Speaker Nancy Pelosi’s recent statements against calling for impeachment, arguing that legislators shouldn’t “set a pattern” of seeking impeachment whenever they become the minority. “Impeachment is organic, it has to come up from the public,” he told the Gazette. Mr. Keating stressed that while news coming out of Washington tends to showcase the party divide and the loudest voices, there is plenty of bipartisanship behind the scenes on legislation, like requiring stronger background checks for purchasing a gun. He said the midterm election gave a clear mandate for the lawmakers to not be caught up in the gridlock and to legislate, and that’s what he plans to do in the coming term.